This orange spice banana bread smells absolutely amazing. The aroma fills the house with the pungent fall spices. It is so hard to wait until the bread is completely cooled before pinching off a nibble. The most important tips I can pass on is to make sure the cream cheese is completely softened. Unwrap the bar and leave it out for at least 25 to 30 minutes to soften. 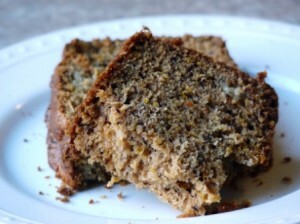 Brown speckled very ripe bananas are the best type of banana to use in banana bread, it gives the bread a more intense banana flavor. This rule may be broken if you are looking for a subtle banana flavor to showcase the orange. Lastly blend the wet ingredients well, no lumps remaining in the cream cheese, before combining with the dry ingredients. Preheat oven to 35o degrees F. Grease a 9×5 inch loaf pan with cooking. Sift together the flour, sugars, baking soda, salt, orange zest, cinnamon, nutmeg, and allspice. Set aside. Mix the mashed bananas, cream cheese, eggs, butter and vanilla using a wooden spoon. Gently combine the flour mixture with the mashed banana mixture until just combined. Do not overmix; the batter should look slightly lumpy and thick. Pour batter into the prepared pan. Bake for 55-65 minutes, or until toothpick comes out clean. Cool for 5 minutes in the pan before removing. Cool on a wire rack.